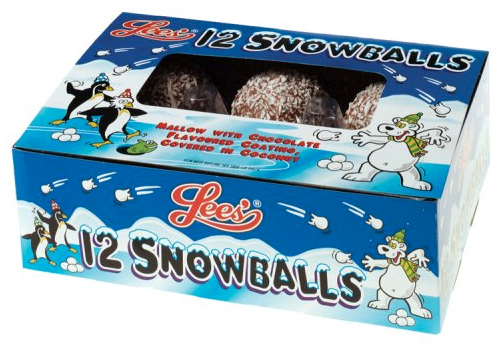 Well, my mom sent me a package of Lee’s Snowballs from Scotland, and the package looked very retro and the cookies looked a little scarey. Since they were a gift, I decided to try one, and I’m so glad I did. The cookies are about 1 1/2 inches in diameter, so just the right size. The filling was soft marshmallow, covered in thin chocolate coating and toasted coconut; really yummy. No one else in my family wants to try them, so they’re all mine. They are sweet enough that one, or two is all you need. These would be amazing in a mini version. They are 70 calories each, so all-in-all, not too bad. I’ll still steer clear of the pink, Hostess variety, though. I shouldn’t be a bit shocked that they’re good. The U.K. makes the best sweets in the world. I can’t say I’ll crave these, but they won’t go to waste. Thanks, Mom, or should I say Mum?! Posted in coconut, Cookies, Milk chocolate and tagged chocolate coating, dessert, toasted coconut. Bookmark the permalink.